Zip front jumpsuit with hood. 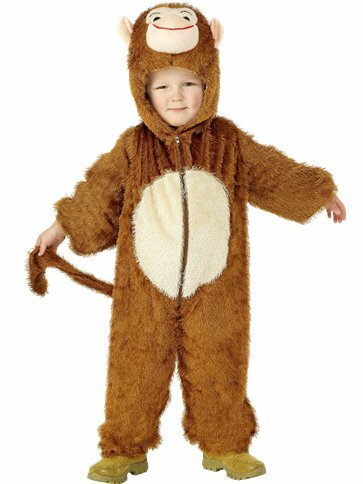 This child's Monkey Costume consists of an adorable, easy to wear, soft, brown jumpsuit with tan coloured central panel, elasticated cuffs, ankles, full zip fastening to the front and attached fluffy tail. The hood is fully lined with a cute, padded monkey face and padded ears. This is an adorable costume, perfect for dressing up, monkeying around and ideal for any fancy dress party. Want it Friday, 26 April? Order it within 2hrs and 3mins and choose Premium by 9pm Delivery at checkout.